The Atlanta Thrashers are officially out of the playoff hunt, and the Florida Panthers might not be far behind. The Panthers look to improve their slim postseason chances on Thursday when they host the slumping Thrashers. Florida (36-32-9) lost in regulation for the first time since Feb. 29 on Tuesday, falling 3-1 in Tampa Bay. The Panthers had been 8-0-1 over their previous nine games, but are tied with Buffalo for 10th place in the Eastern Conference, five points out of a playoff spot with five games remaining. "There's nothing we can do," Florida coach Jacques Martin told his team's official team Web site. "There's no sense crying. We have five games left, and we have to win all five." Two of those games are against ninth-place Washington, which is three points ahead of Florida, and one is against Southeast Division-leading Carolina, which owns a seven-point lead over the Panthers. The other two come against the Thrashers (31-38-8), who were eliminated from playoff contention with Friday's 5-3 loss to the Capitals. After facing Atlanta on Thursday, the Panthers wrap up their home schedule against Washington on Saturday. Florida is 18-13-8 at the BankAtlantic Center this season, but has gone 6-0-1 in its last seven games there. 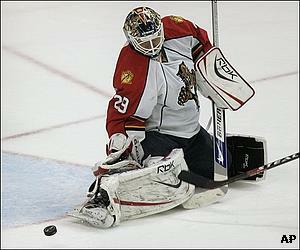 David Booth scored the lone goal Tuesday for the Panthers, who have not reached the postseason since 2000. Florida had scored at least three goals in six of its previous seven games. "Some people weren't good enough, that's the bottom line," Martin said. "The Stephen Weiss line produced nine scoring chances. Other people have to pull their weight. "It's very disappointing, because I know some people care and gave us a strong game. But you need to have everyone going when it comes to games like that." Left wing Jozef Stumpel returned after missing 23 games with a shoulder injury and logged 14:39 of ice time. Stumpel, who scored a career-high 23 goals last season for Florida, has seven goals and 12 assists in 47 games in 2007-08. The Panthers have won their last four games against the Thrashers and have taken four of the last five matchups in Florida. Atlanta owns the second-worst record in the East, ahead of only the Lightning. The Thrashers have lost five straight overall and blew a 3-1 lead entering the third period on Friday, overshadowing Jim Slater's first two-goal game in the NHL. "I don't know what we were doing, but it wasn't good, obviously. It's tough giving up four goals in the third like that to lose a game," Slater said. "They were a hungrier team in the third, and it showed." Atlanta's Tobias Enstrom, who leads rookie defensemen with 38 points, chipped in his fifth goal and tied Jaroslav Modry's 2005-06 franchise record for most points in a season by a defenseman. Still, the Thrashers lost for the 15th time in 17 games. "We've had a hard time, pretty much the whole year, putting together a 60-minute game," captain Bobby Holik said. "At least that's one thing we're consistent with."